1859 Envelope to Manchester from London with, on the reverse, a very fine circular-framed straight line HARROW. 1822 Cover to London showing a fine Staines/Penny Post and circular Receiving Office 'No 1' of ASHFORD (Middlesex). 1845 Entire addresed to Stourbridge Ironworks, Worcestershire showing a very fine HAYES-TOWN, Middlesex, undated circle in red. 1912 'London FBP (near the Station, Finchley/Church End, N.)' Parcel Post Label franked by a 4d Orange, SG 286, Perf 15 x 14. 1905 Parcel Post Label, 'ENFIELD, MIDDLESEX (EF)' franked by a 1d Scarlet, SG 219, 4d Green & Brown, SG 236 and a 5d Dull Purple & Blue, SG 242. 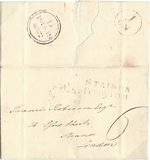 1844 London Cross Post 1d Pink Stationery envelope addressed to Exeter cancelled by a very fine Kensington Maltese Cross and showing on the reverse a very fine Kensington/Penny Post, Type 5. Hounslow cds on the front. 1912 3d Brown Edward VII Registered envelope to Holland franked by a 1½d, SG 289, tied by an ASHFORD.STATION/MIDDX cds. The Registered label is cancelled by a very fine ASHFORD.STATION/MIDDLESEX undated circle. 1793 Cover to Edinburgh showing a fine convex STAINES, MX 262'F' - the scarce, large type. 1907 ENFIELD, MIDDLESEX (EF) Parcel Post label franked by a 4d, SG 238 and a 5d, SG 244 tied by very fine ENFIELD/MIDDLESEX circular datestamps. 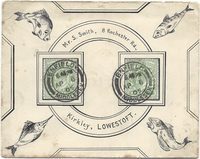 1901 ASHFORD STATION (ASN) (UNDER STAINES) Parcel Post label franked by a 6d, SG 208 tied by a Staines rubber cancel and showing a very fine ASHFORD.STATION/MIDDLESEX cds. 1859 1d Rose-red, SG 40, J-F, tied to envelope to Wareham by a fine UXBRIDGE 830 duplex, showing on the reverse a very fine DENHAM undated circle.